Victoria Cross recipient Mark Donaldson is living an extraordinary life for a young man whose family background could have seen him take a very different path. He was a rebellious teenager who lost his Vietnam veteran father in his mid-teens and a few years later, his mother disappeared, presumed murdered. He had a choice – a life of self-destructiveness and petty crime or the chance to change the pattern. Mark chose the Army. It turned out to be a superb alternative and, in time, one that would become truly inspiring for the youth of Australia. On 2 September 2008 in a valley in eastern Afghanistan, Trooper Mark Donaldson made a split-second decision that would change his life. His acts of exceptional gallantry in the face of sustained enemy fire ultimately saved the life of a coalition force interpreter and ensured the safety of the other members of the combined Afghan, US and Australian force. His display of extraordinary courage that day saw him awarded the Australian Victoria Cross for Gallantry – the ultimate symbol of heroism. 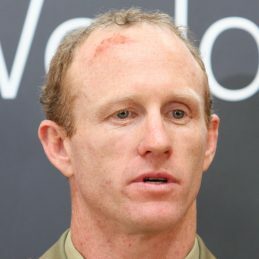 When Mark Donaldson joined the Australian Army in 2002, at the age of 23, he proved himself to be a natural soldier who excelled in the training and discipline of army life. He set himself goals and planned a program that would see him pass the most rigorous of mental and physical tests to become a member of Australia’s elite Special Air Service (SAS). Tours of East Timor, Iraq and Afghanistan followed and today Mark carries the reminder of how luck can be an important ingredient in success. A bullet remains lodged in his leg to this day to keep him focussed. Mark Donaldson VC knows what it takes to lead. He knows what it is like to take responsibility for personal and team success. He knows how crucial effective communication is to the success of any plan. Mark knows what makes an effective team. He knows how critical it is for leaders to be agile in their decision making and how important resilience is in both the planning and implementation phases of an operation. In his world, lives depend on it. Mark continues to serve in the SAS. He has written a bestselling book, The Cross Road – a story of life, death and the SAS, and he is the Patron of ‘Soldier On’, a philanthropic group assisting soldiers to settle back into Australian life after being in harm’s way on duty overseas. Mark Donaldson talks frankly about his transformation’ from zero to hero’; his life is a testament to what can be achieved through sheer courage and determination.